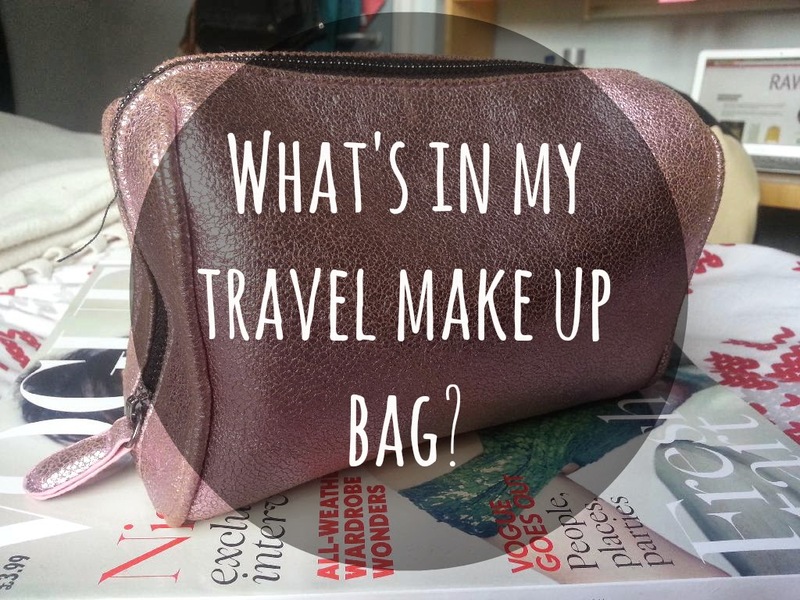 What's in my travel make-up bag? | RAWR BOWS. Hello everybody! As you may all know I am home now for my Easter break, I didn't take a lot of make up with me as a) I have to revise so I won't be using a lot of make up on a daily basis and b) I don't usually wear make up when I am in my hometown. So, I only took the essentials and some extra stuff for those night outs we all love. Here's what you will find in my travel make up bag! My make up bag is from Topshop and it's in a metallic pink colour. I like the texture it has, it reminds me of the crackle nail polishes. I got it on sale for £5 I believe and I'm afraid I can't find it on the website but they might have it in stores as I only bought it a few weeks ago. So, for my 'face make up' I have my current foundation which is the SuperStay Better Skin foundation by Maybelline and it's supposed to have some vitamin that helps your skin look clearer in 3 weeks. I also have my loved (and as you can see quite old) Stay Matte powder by Rimmel London, this is like the third one I have so you can really tell how much I love it. For concealer I have the NYX Above & Beyond Full Coverage Concealer, and let me tell you, this is literally full coverage. To give some colour to my face and not look like a ghost I have two blushes and one bronzer. The first blush is a cream blush by Maybelline in the shade 06, it gives a very natural and healthy look but I find it a bit hard to apply. My next blush is the Essence Floral Grunge blush in the shade 01 Be Floweful, I love this one for spring and summer as it's like a bright pink/orange colour. For bronzer I have the Maybelline Dream Sun Triple Bronzing Powder in 02 Brunette/Brune, what I love about this product is that you have three shades so if one day you want a more dramatic look you can use only the dark one. For eyes, I like to keep it simple so I have my Clinique cream shaper for eyes in 105 Chocolate Lustre, this is one of the first eye products I bought and I love it, it looks so natural and pretty. I've tried to find some dupes as this one is a bit expensive but I can't find the exact colour so if you know any good dupe of this let me know! I also have my holy grail aka my Master Precise liquid eyeliner by Maybelline, I use this almost everyday and I don't know what I would do without it. For my lashes I have my The MAX Bold Curves Mascara by Rimmel in 001 Black. To make my brows look perfect I have the NYX Eyebrow Cake Powder in Black/Gray. Finally, for brushes I have my two essential brushes. The first one is a Bourjois kabuki brush that I use for basically all the powders like bronzer, blush, etc and then I have what I use for my foundation, the Real Techniques Expert Face Brush. This is all I have in my make up travel bag, however I also brought with me my Sleek palette, some lipsticks and two eyeshadow brushes, just in case I have to dress up some day. I put these things in my suitcase so this is why they are not in this post! What do you keep in your travel make up bag? I pack concealer and foundation as well (my skin needs it!) but I like to bring smaller sizes. One trick that I learned is to squirt foundation into an old contact lens case and use that as a new pot.